Carl Larsson "Child in the woods" (detail). Signed C.L. Executed in 1899. Watercolour 46 x 34 cm. Managing director Georg Granström; private collection. Liljevalchs konsthall (Liljevalchs public art gallery), Stockholm, "Carl Larsson. Minnesutställning", 1953, no. 734. Ulwa Neergaard, "Carl Larsson. Signerat med pensel och penna", 1999, illustrated in colour p. 260 and catalogued under year 1899, p. 77, no. 894. 509. 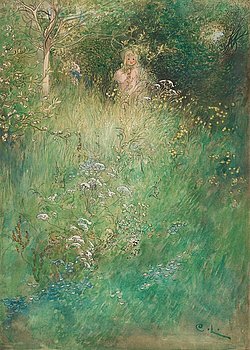 Carl Larsson, "Barn i skogen" (Child in the woods).